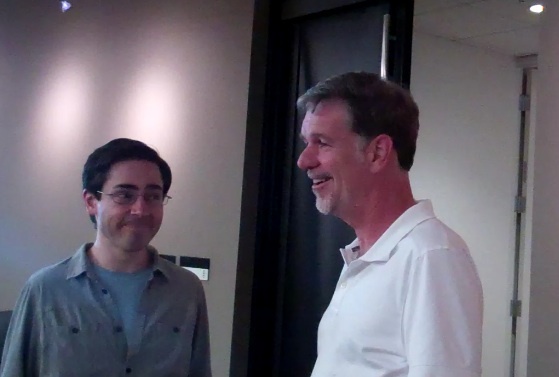 Comedian Mark Malkoff chatting with Netflix CEO Reed Hastings. Mark Malkoff just can’t help himself. The new York-based comedian is one of those people who find challenges in everything. So when a company like Netflix (s NFLX) offers unlimited streaming for $8 a month, someone like Malkoff starts to wonder about his own limits. Earlier this year, Malkoff embarked on his Netflix challengein an attempt to figure out how much value he could get out of his $8 subscription within a single month. 30 days later, Malkoff had watched 252 movies, beginning to end, including the credits. Excessive use like this might have triggered automatic service suspension at other companies, but quickly Netflix realized the promotional potential of his challenge, and started tweeting about it. This week, the company even invited him to their headquarters where dozens of employees celebrated him as the most obsessive user the company ever had. “It was an interesting, interesting month for sure,” said Malkoff on stage one on Netflix’s on-campus theaters, adding that he hasn’t been able to enjoy movies the same way ever since. During the challenge, Malkoff at first relied a lot on Facebook (s FB) and Twitter for movie recommendations, but eventually figured that websites like Instantwatcher can do a better job. He also began to watch movies based on themes at some point of the challenge, and discovered unexpected joy in watching High School Musical and a Justin Bieber documentary. His device of choice was an Apple (s AAPL) TV, he told his audience of Netflix employees. But after days of just sitting on the couch, he decided to take walk around the block – while watching Netflix movies on an iPhone, with his wife as a helpful guide so he wouldn’t bump into things. 256 Movies. Isn’t that all of them! I did embark on TV Series marathons on NEtflix for shows like Blue collar and Supernatural… makes me still wonder why i did it… but netflix does rock!!! The whole idea here is more than silly. 256 movies – 30 days is 8/day or about 16 hours/day watching movies, not something human life enjoys; and let’s face it, he didn’t really watch them. I could easily “watch” movies 24/hr/day. big deal. I’ve actually watched more than 240 movies but it took me about four years. The question is how he manage to select 256 movies worth watching on netflix !! I don’t know maybe by the twitter recommendations or the third party website which provides recommendations as well. Oh wait, that was a zinger…should have realized with the lack of capitalization and double exclamation point. Clay says sounds like a competitor that can’t match Netflix. Netflix is the best value in the planet. Did you actually READ the article? He had no contact with Netflix until he was done.